You'll be £12.99 closer to your next £10.00 credit when you purchase Berwick-upon-Tweed in the Great War. What's this? Berwick-upon-Tweed was an important garrison town and regional centre, which, as befit its history, had a strong sense of duty, reflected in its proud martial traditions. During the catastrophic years of 1914-18 many Berwick families found themselves greatly affected by the war. Large numbers of Berwick men volunteered to serve in the forces and many were killed. During the first months of war the local barracks were overwhelmed by the number of men volunteering for the King's Own Scottish Borderers, while a great many Berwick lads served with the Northumberland Fusiliers. Others were less keen to serve and this book considers some of these cases, ranging from hairdressers to farmworkers, who were brought before the military tribunal at Berwick. For many of those left behind the war was a time of worry and hardship. Others saw the business opportunities, and this book includes the telling accounts of the Berwick women who were imprisoned for running brothels, which were used by the many soldiers in the town, along with accounts of petty theft and profiteering. Berwick also suffered from wartime policies and severe shortages and these issues are meticulously analysed throughout with a view to how they affected the people of Berwick. As a port, Berwick witnessed the aftermath of the sinking of merchant vessels and the people of the town were keenly aware of the sacrifices being made. They went to great efforts to provide support for those fighting the war, despite the shortages they themselves were suffering from. 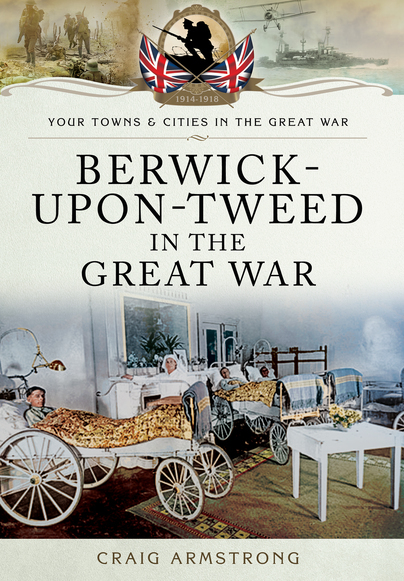 These efforts are explained in the book, which is a testimony to the bravery, self-sacrifice and determination of the people of Berwick during the Great War.